Welcome to A Complete Sweep the polite & only fully qualified professional chimney sweeping service based in Camberley & the surrounding towns, serving Surrey, Hampshire & Berkshire. All types of chimneys swept:- Woodburning stoves, open fires, convections box fires (Jetmasters/Tortoises), biomass boiler flues, Agas, commercial pizza oven flues, inglenooks, gas fires & fireplaces within historic buildings. Birds nests removed, CCTV inspections carried out, chimney cowls, chimney balloons, caps, bird guards & carbon monoxide detectors supplied & fitted. 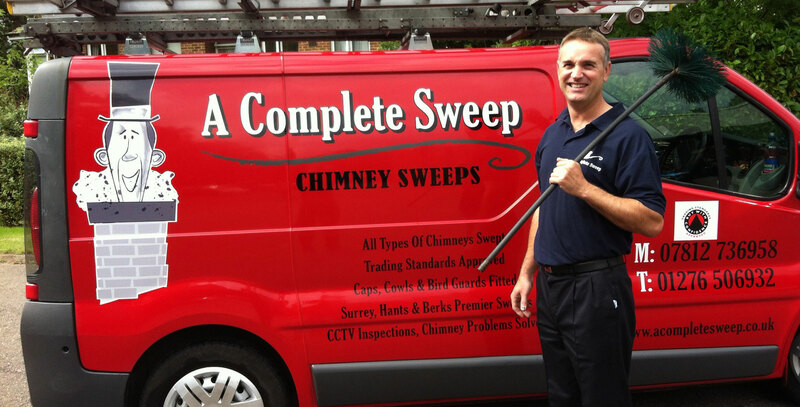 A recognised, accredited chimney sweeping certificate issued after every complete sweep. Friendly, helpful, reliable modern brush, vacuum and rotary power sweeping, clean tidy service all work fully insured. Evening & limited weekend sweeps also available. Don’t take the chance of a chimney fire! Copyright © 2019 A Complete Sweep.